At $289 this is a relatively affordable handbag by designer standards, but I can't figure out where the label's skimping. The gentle, natural slouch of the leather shows you its incredible quality. 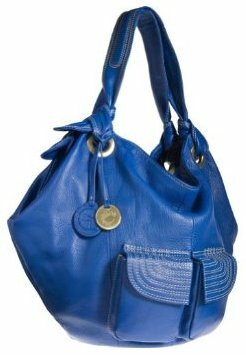 The knotted handles and stitched front pockets give the Scherzo some individual flair. Happily those details don't bend to trends, so this bag won't date either. That timelessness is a real advantage, because once you start using the Scherzo I don't think you’ll want to let it go. Those front pockets are just the start of the functional features. Turn it around and you'll see a large zippered pocket. Open it up and you're treated to another zippered pocket and an open one for sunglasses or gadgets, not to mention a luxurious amount of storage space. If I had one criticism it'd be Alla Leather Art's fairly neutral color palette. This royal blue bag is exciting, but the other shades are a bit bland. But frankly I'm clutching at straws. The Scherzo is definitely a bag on my wish list. The Alla Leather Maestros bag, a great alternative to this shoulder bag.